If you’ve come to read this blog for the first time, you should know that the messages posted here are in “reverse” order. It’s kind of odd, but that’s how “blogs” work. So, strangely enough, the message posted just below this one is in fact the last one. You might want to start at the beginning. After reading an entry, you can easily get the next one by clicking on the title/link on the upper right corner of each message page. So, to start at the beginning of our little story, click HERE. Alternatively, you might want to read some background information by clicking on the page labeled “Introduction” on the right side of this screen. Kevin and his balloon headed West on Interstate 80 on Thursday afternoon. Things are kinda quiet around here today. 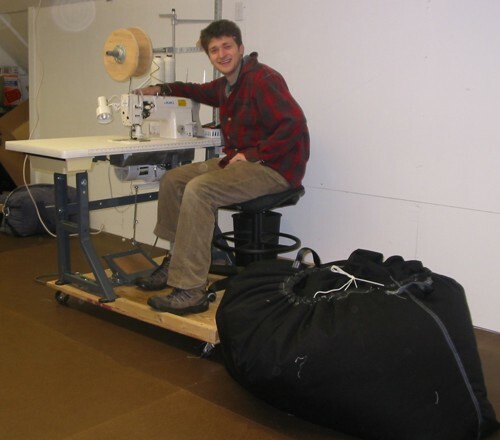 Before his departure, Kevin sewed a bag for his new balloon and put together a tally of his expenses on the project. You can find the expense list on the link to the right labeled “Materials Price List”. I’d like to express my thanks to all the folks who provided advice, encouragement, and/or materials. 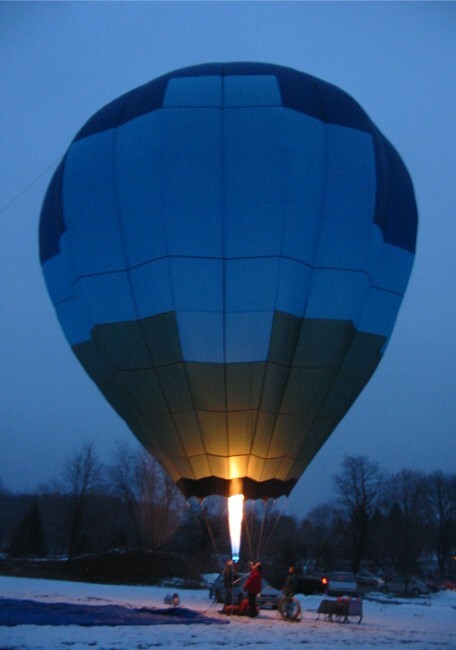 In addition to those mentioned in previous posts and elsewhere, I would like to particularly thank Paul Stumpf of Stumpf Balloons for his wise and patient counsel. And thanks to y’all for your interest and comments. This blog has been surprisingly popular. It’s been getting “hits” from more than 100 unique IP address each day during the last week of the sewing. It seems that balloon-building and/or Kevin are more popular that one would have supposed. 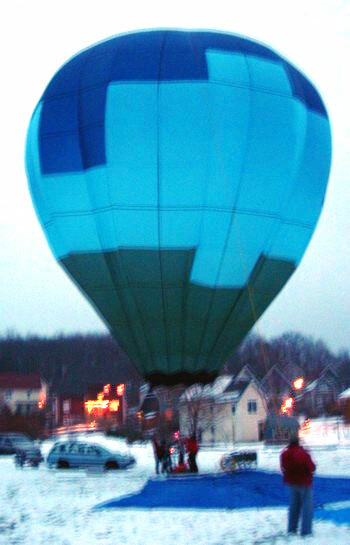 I’ll post here from time to time with updates as Kevin finishes the rest of the balloon. 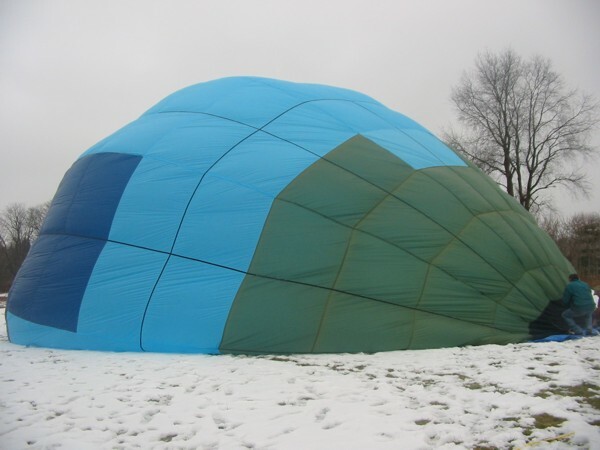 The further steps include finding a “bottom end” for the balloon, FAA inspection, airworthiness certification, flight testing, etc. But the rate of the posting will, obviously, be far less than for the past few weeks. If the tale told here has piqued your interest in building balloons, please help yourself to the information at xlta.org. 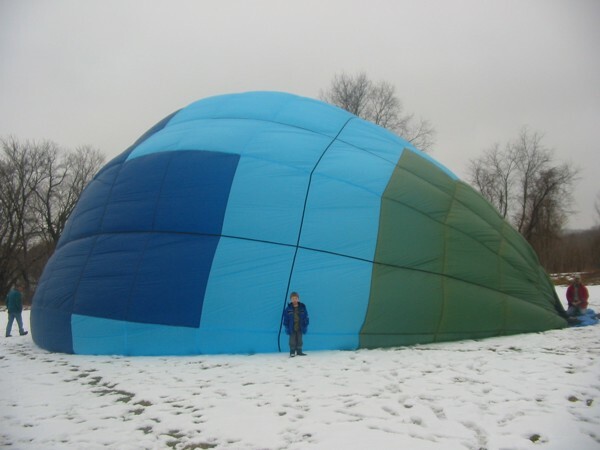 Also, there is an email list of balloon builders that is a terrific resource. (A pointer to the list can be found on the Links page of the xlta.org site.) 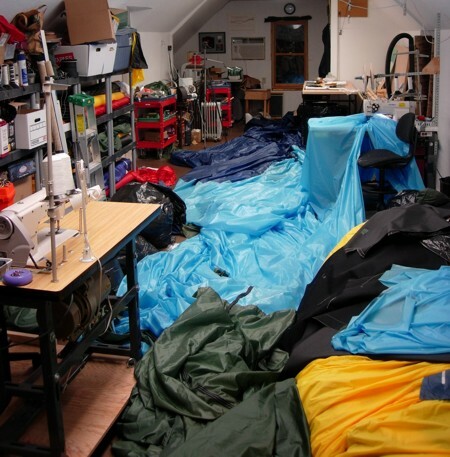 I think it’s fair to say that Kevin would not have been able to build his balloon without the resources and people he found via the email list. And finally, below are some more pictures from this past week. As always, click on the small picture below to get a full-sized image. 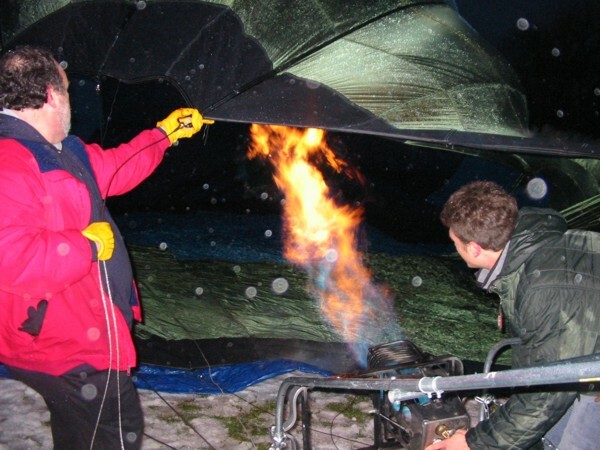 Kevin expects to return to Amherst with his fully finished and certificated balloon this June at the Experimental LTA Gathering that I host on the weekend following Memorial Day. You can find out more about that at xlta.org. The weather gods seem to be smiling. Monday looks cool and cloudy but very calm. So Monday may well be the day to stand up the balloon. Kevin has made good progress in spite of frittering away most of Sunday with his visiting sister. All of the Nomex panels have been attached and the bottom of each vertical seam has been finished. That said, Kevin still has a fair bit of work to do. He still need to finish both the top and bottom load tapes, close the final vertical seam, and then join the horizontal load tapes. But that seems well within the range of reason given his habit of long nights. Very exciting for all concerned. Kevin was up all night sewing away. All of the Nomex has been cut and attached to the bottoms of the gores. He’s also finished four of the seams at the bottom. 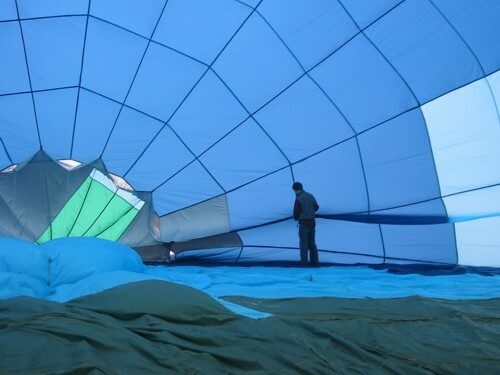 The best window for standing up the balloon is Sunday morning. Unfortunately, it looks very unlike that Kevin will be finished sewing by that point. And, even if he stayed up another night to get it done, he’d be in no shape to point a 15 foot flame in the direction of his precious creation. Kevin’s gone through a fair bit of his “To Do” list. The horizontal tapes have been attached. He’s also nearly finished with the top vent (including a very nice hem around the edge.) 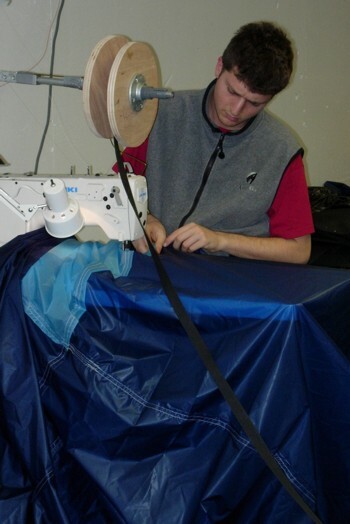 The major items that remain are attaching the vertical load tapes to a load ring (a metal ring) at the top, sewing the last vertical seam, finishing the load tapes at the bottom, and adding the bottom panel of Nomex. Of course, Kevin now faces the classic problem that the first 90% of any task takes 90% of the work and the last 10% of the task takes the other 90%. 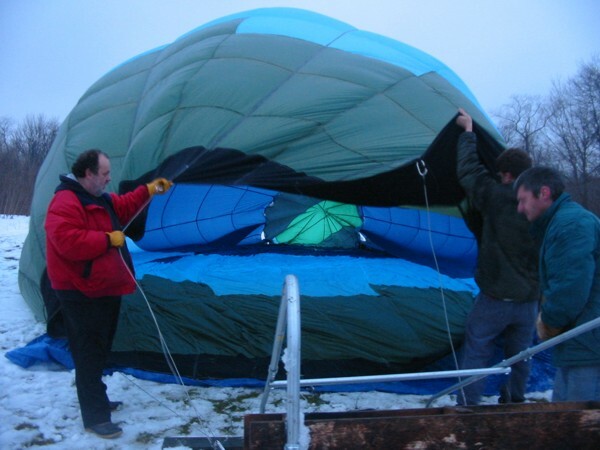 But we’ere still hoping to stand the balloon up sometime around (or shortly after) this coming weekend. Kevin can get a lot of work done on his 10 sewing binges. The Nomex is the only major sticking point. Due to an (as yet) unexplained delay by FedEx, the Nomex has languished in the New York area for several days. The person who answers the FedEx telephone claims it will be delivered tomorrow. Given that Kevin has been listening to Thomas Friedman’s “The Worlds is Flat” as a book on tape, he’s convinced that this person is somewhere in India. So it’s not as if this person is anywhere near the package in question. Not much to do at this point but trust in FedEx’s computer technology. This evening was greatly enlivened by the arrival of a genuine Louisiana “King Cake” sent as a Mardi Gras gift from Kevin’s Mom to my family. Kevin came over this evening to lead us through the ceremonial “search for the baby”: a small token infant symbolizing the Christ Child is hidden in the cake and the person whose piece of cake contains the baby is “crowned the King” (or Queen as appropriate) for the evening. As it happened, my son Gavin obtained the noble designation. Quite a yummy cake too. A good time was had by all. Many thanks to Mother Herschman. Well, it finally happened. Kevin reached the great chasm that separates guys (as defined in The Dave Barry’s Complete Book of Guys) and sewing. Yes, sexual identity inevitably comes into play when any person possessing a “Y” chromosome sits down at a sewing machine. I can’t tell you how many oh-so-funny “seamstress” remarks I’ve heard over the years. But lo, Kevin now had a circle with “raw” fabric edges. Not a good thing as raw edges tend to fray and the seams that terminate at the edge are no longer “locked” with back-tacking. What to do? The standard procedure is to fold the edge of fabric over twice so as to bury the raw edge inside the folds and run a line (or two) of stitching along the folded edge to hold it in place. “Is that what people call ‘hemming’?” Kevin asked. “Yes” is replied blithely. “I don’t want to do it! I’ll sew load tapes around the edge! Anything! I can’t HEM! — HEMMING is for girls!” And with that, the floodgates were opened and a deluge of repressed gender identity stress came roaring forth. I have endless sympathy for his reaction. My Mom sewed a great deal of her own clothing when I was a child. And my Mom, being a proper “libber” in her day, was quite amenable to having my brothers and myself (no sisters in the family) learn to work the sewing machine. In truth, I didn’t give a hoot for the product; I was much more interested in the machine itself. Cool mechanism. Highly refined technology. But clothes, I didn’t care about clothes. And, although I don’t think I actually put words to it at the time, I had a strong sense that guys just didn’t do this sort of stuff. There were limits as to how liberated I was willing to be. The repulsive force between sewing and guys is a fairly powerful phenomenon. In addition to the “What, am I gonna sew doilies or somethin’?” reaction there is the fact that fabric is a maddeningly unpredictable substance. If you measure a 2-by-4 one day and then come back and measure it the next day, it will be the same size. (OK, its length will be a minuscule fraction different, but the difference will be too small to detect with your average Home Depot variety tape measure.) But measure a reasonably large (say 15 feet long) piece of fabric one day and it may be an inch or so different length the next. Changes in humidity, temperature, tension on the fabric, etc all have large effects. For a typical guy, who’s used to working with a milling machine where 1000ths of an inch are the expected level of accuracy, this sort of dimensional unreliability is simply more than he can bear. Miraculously, women are not so bothered by such erratic behavior. My wife claims it is a coping strategy that evolved from having to put up with guys. Somehow, it seems like a good idea to not argue with my wife on this topic. In addition to the fact that with fabric 2+2 never quite seems to be exactly 4, the other great impediment to guys sewing is the need to go into fabric stores from time to time. Such trips are unavoidable because fabric stores are the only place to get a seam ripper, needle threader or other specialized but necessary tool. And fabric stores are truly distressing places for guys. You are nearly certain to be the only guy in the place. Every time I go I feel like I’ve crashed a bridal shower or something. All it takes is some unfortunate incident, such as a sale on calico chintz or having somebody ask you what “she” (the person for whom you are obviously buying the tool) wants to do with it, and it isn’t too hard to imagine why most guys run away screaming — usually in a mad search for a machine shop or other place with greasy tools where he can recover some sense of psychic stability. By my calculations, about 3% of airplane pilots build their own airplanes. For balloons, the number is closer to 1%. The way I figure it, it’s the sewing that gets in the way. Maybe we should get some marketing folks to come up with a different name. “Woven material bonding techniques” perhaps. Ah but, it won’t work. One seamstress crack and the whole facade will come crashing down. When I left Kevin last evening, he was still contemplating what to do about the edge of the vent. I’m sure he’ll find his way past this little bump in the road. But he’s still a bit shaky. It will be a while before I send him to the fabric store. Perhaps we’ll make a trip to Home Depot today. We need some rope and other manly stuff anyway. After a couple of big days, Kevin has worked nearly 20 of the past 48 hours — finishing at 5 AM Sunday, all of the vertical load tapes have been attached and the 12 gores have been joined into a single piece. To reach this point, Kevin has put in a total of approximately 100 hours of work. 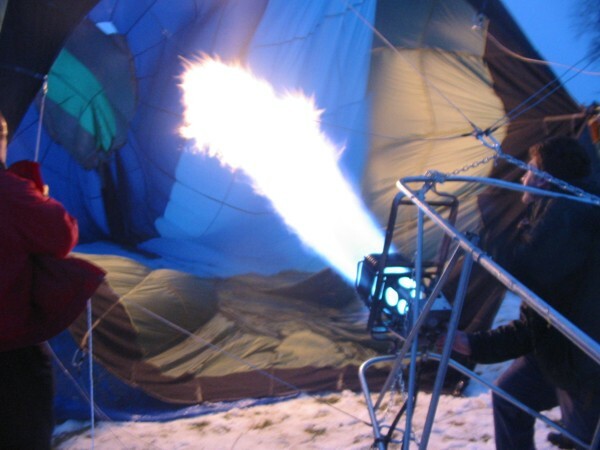 Kevin is planning to buy/beg/borrow/steal a basket and burner set-up (in ballooning parlance these are collectively known as the “bottom end” of the balloon.) So the remaining tasks for this month are focused on completing the envelope. 2. Attach loops, cordage, and Velcro for vent. Kevin has a busy week in front of him. 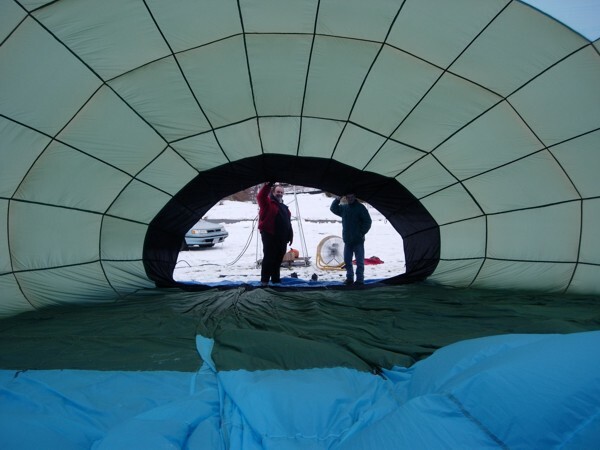 But, with luck, we’ll be looking for a calm day sometime next weekend to “stand up” the balloon for the first time. Kevin has to hit the road early the following week. That leaves a few days to spare, but not many.